Annuals or biennials, 40-200+ cm. Stems glabrous to tomentose; teeth of wings to 10 mm, wing spines 2-10 mm. Leaves: basal tapering to winged petioles, blades 10-40 cm, margins 1-2×-pinnately lobed; cauline sessile, shorter, margins less divided, glabrous or ± hairy. Heads borne singly or in corymbiform arrays, sometimes a few axillary, at least terminal head usually conspicuously pedunculate, often nodding, 20-40 mm. Peduncles 2-30 cm, unwinged distally or throughout, finely tomentose. Involucres hemispheric, 20-60 mm × 20-70 mm. Phyllaries lanceolate to ovate, outer and middle with appressed bases 2-4 mm wide and spreading to reflexed, appendages 2-7 mm wide, proximally glabrous or ± tomentose, distally glabrous to minutely scabridulous. spine tips 1-4 mm, inner phyllaries with unarmed, straight or twisted tips. Corollas purple, 15-28 mm, lobes 2.5-3 times longer than throat. 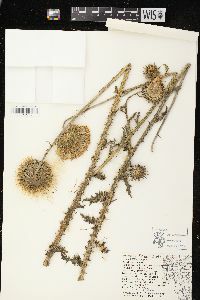 Cypselae golden to brown, 4-5 mm; pappus bristles 13-25 mm. 2n = 16. Flowering late spring-summer (May-Sep). Aggressive weed of waste ground, pastures, roadsides, fields; 0-3000 m; introduced; Alta., B.C., Man., N.B., Nfld. and Labr. (Nfld. ), N.S., Ont., Que., Sask. ; Ala., Ariz., Ark., Calif., Colo., D.C., Ga., Idaho, Ill., Ind., Iowa, Kans., Ky., La., Md., Miss., Mo., Mont., Nebr., Nev., N.J., N.Mex., N.Y., N.C., N.Dak., Ohio, Okla., Oreg., Pa., S.C., S.Dak., Tenn., Tex., Utah, Va., Wash., W.Va., Wis., Wyo. ; Eurasia. 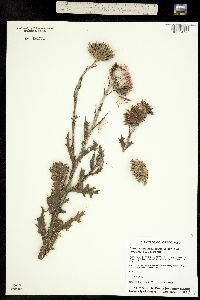 Although reported from Connecticut, Delaware, Indiana, Massachusetts, Michigan, New Hampshire, Ohio, and Rhode Island, I have seen no specimens of Carduus nutans from those places. 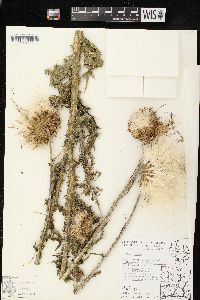 Carduus nutans is part of a variable complex that has been treated as one to several species or as a single species with several subspecies or varieties. The New World plants apparently represent multiple introductions, probably representing more than one of these taxa. 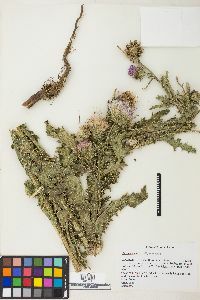 Various intermediates are evident, and many specimens cannot be reliably assigned. Insufficient evidence exists to reliably apply the names of the various segregate entities to North American material. In a biosystematic study, two subspecies of C. nutans were differentiated in Canada (A. M. Desrochers et al. 1988). Subspecies nutans was characterized as having arachnoid phylla-ries with the terminal appendage only slightly wider than the appressed phyllary base, moderately to densely pubescent leaf bases, and a head diameter of 1.5-3.5 cm. Subspecies leiophyllus in contrast has glabrous phyllaries with the terminal appendage definitely wider than the base, glabrous or slightly pubescent bases, and heads 1.8-7 cm in diameter. Subspecies nutans was distributed in eastern Canada from Newfoundland to southern Ontario and subsp. leiophyllus from Ontario to British Columbia. Whether the results of the study (Desrochers et al.) are applicable to all the populations of musk thistles occurring in the United States has not been determined. 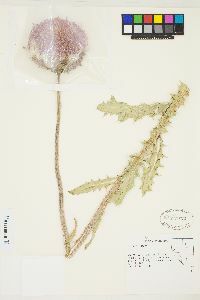 Hybrids between Carduus acanthoides and C. nutans (C. ×orthocephalus Wallroth) have been documented from Ontario and Wisconsin and probably occur at other sites where the parental taxa co-occur. 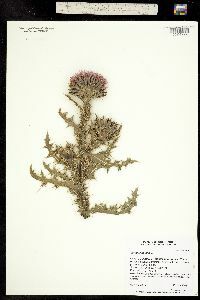 Nodding thistle is one of the most serious weeds in North America. It is unpalatable to wildlife and livestock and often forms dense, impenetrable stands in pastures and rangelands. It readily colonizes disturbed sites in many different habitats. A single large terminal head can produce as many as 1200 cypselae. Efforts to control musk thistle infestations with Rhinocyllus conicus, a European seed head weevil, have met with some success, but concerns have been raised because this parasite also attacks native Cirsium species. Hansen (Proc. Indiana Acad. Sci. 34: 257. 1925) reports that this species was found established in a few fields east of Elkhart. Miss Edna Banta, in 1934, found it in a pasture field along Lost Fork Creek near Brooksburg, Jefferson County. She writes that it has been known in this locality for about 17 years and it is spreading, since no determined effort has been made to exterminate it. In 1935 Kriebel found it in Posey County in a pasture between Hovey Lake and Half Moon Pond. Biennial, 3-20 dm; lvs glabrous, or long-villous chiefly along the main veins beneath, deeply lobed, to 25 נ10 cm; heads mostly solitary and nodding at the ends of the branches, usually large, the disk (1.5-)4-8 cm wide (pressed); peduncles naked for some distance below the head; middle and outer invol bracts conspicuously broad (2-8 mm), with long, flat, spreading or reflexed, spine-pointed tip; inner bracts narrower and softer; 2n=16. Roadsides and waste places; native of Europe, now widely established in the U.S. and adj. Can., commoner westward. June-Oct. (C. thoermeri) Hybridizes with no. 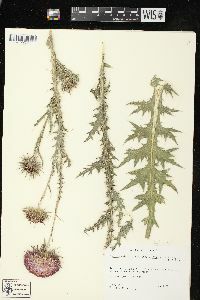 2 [Carduus acanthoides L.], the hybrids partly fertile.